Image Size: 15.5 X 10.5 in. 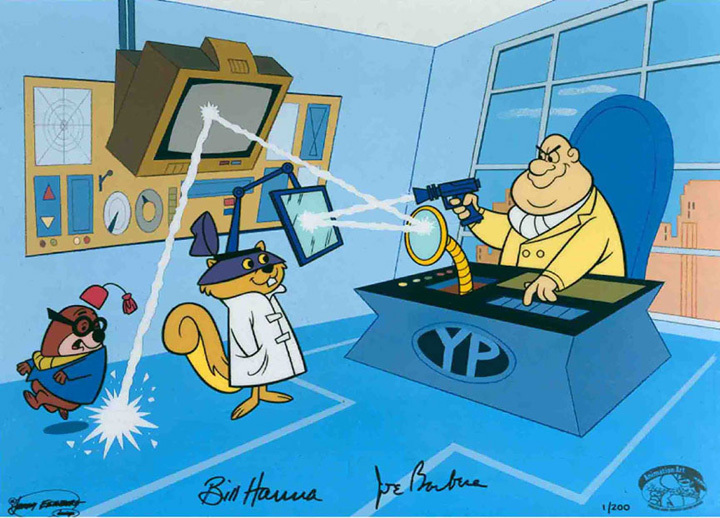 Hanna-Barbera Studios capitalized on the James Bond mania in the sixties with “The Atom Ant/Secret Squirrel Show”, premiering October 2, 1965. Secret, voiced by Mel Blanc, was often given the mission by Double Q to apprehend the arch enemy of the International Sneaky Service, Yellow Pinkie. The design credit for this Limited Edition Cel goes to Jerry Eisenberg, who originally designed Yellow Pinkie while working as a layout man for the Studio. Each Yellow Pinkie is signed by William Hanna and Joseph Barbera, the creators of everyone’s favorite secret agent rodent.